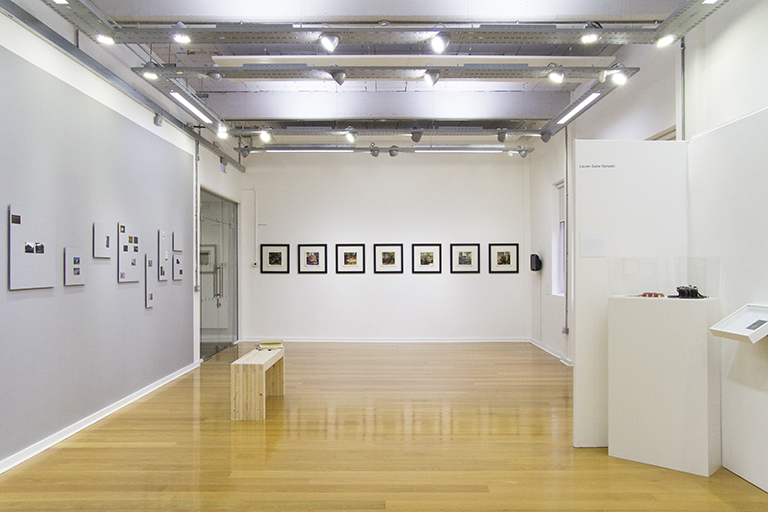 The Traces exhibition showcases the work of MA Photography students from the University of Sunderland and contains a thematic similarity whilst showing a diverse set of approaches. Held at the Priestman Gallery in Sunderland with the Private Viewing held on Thursday 13th of October, each artist produced work with aspects of loss, memory and relationships, examining the traces we leave. In The Entropy Garden, Mara Acoma examines the idea of a relationship with a place forming the embodiment of memories and future dreams in an external locus for consciousness. Considering the garden itself as a collaborator from the act of creating the initial images through post-production into objects by the submersion of the prints into the garden pond. The exhibition installation focused on the emotional response aspects of the project and incorporated video featuring birdsong from the garden. Geoffrey Bradford considers the place of work itself along with objects and the traces of human presence. Rather than viewing his work as having a specific end point of resolution he focuses instead on how each piece of work sets up new questions and further opportunities; ‘what if’ or ‘supposing’ and ‘how would that work’? An approach reflected by his project title of ‘building works’, which shares a variety of objects, created from 3 dimensional constructs, to imaginary machines and transparencies for the visitor to create their own images. Lauren Sadie Marsden explores the possibility of what might have been in her project Ginny. After the passing of her father left a partially finished roll of film in his camera, she explores what might have been by stepping into his shoes to complete the 24 exposures. Exploring the idea of a life journey interrupted through the conventions of the family album and the role of the photograph in the making of memories from the fragments of daily life. Maria Ferrie expresses the discomfort and psychological implications involved in experiencing derealisation and depersonalisation in The Island With No Sunshine. Photographs are used as a diaristic tool through which the author investigated her own perception. Alongside therapy, this allowed her to discover repressed emotions to slowly get back in touch with herself and her pain. She explored her Spanish/English hybrid identity and family history while investigating the relationship between loss, memory and identity. In A Day That Transcends Tomorrow, Vikki Scott reflects the fleeting motion of life, and the melancholy of seeing things in their current state for the last time. The Polaroid photograph serves as a fossilisation of a present moment in time, it is the impression of that moment embedded and preserved in petrified form. The fossilised state of the polaroid photograph shares a painful paradox with the evanescence of memory and time, and that one day these photographic objects will represent nothing but a fragment of a moment – achingly familiar, yet deeply alienating. Emma Jane Biggins considers the emotional and psychological aspects of alcoholism in Beneath The Surface. Examining sufferers’ internal anguish and feelings of low self-worth through the use of familiar domestic iconography to reveal the turmoil and trauma. The work considers the loneliness and isolation pushing towards a numbing of emotions with alcohol rather than simply a lack of self-control. We caught up with Hollie Crawshaw again to find out about her work being at The Big Apple Harvestime Weekend earlier in the month. Here's what she had to say..
I’m Hollie Crawshaw, a graduate from Editorial & Advertising Photography at the University of Gloucestershire! Specialising in agricultural photography, my work aims to document rural related stories, capturing topics surrounding farming, the countryside and livestock. Recently, I held an exhibition as part of Herefordshire’s Big Apple event, with a wildlife painter. The Big Apple Harvestime event in the village of Much Marcle, runs every year and celebrates the autumn apple harvest. With a close community of cider and perry producers, the event attracts hundreds of people each year with visitors able to view the orchards, farms and mills which supply some of Britain’s famous ciders. During the weekend a tractor and trailer escorts visitors to and from the 8 sites spread across the village. My exhibition was held at Awnells Farm, a historic farm breeding traditional Hereford cattle, now owned by the Countryside Restoration Trust and linked to RBST (Rare Breeds Survival Trust). My work was hung amongst the war time farming machinery in an old farm barn and I received a lot of positive feedback from those who attended the 28th Big Apple on 8th-9th October 2016. I have been part of a Facebook group of ladies working within agriculture, since writing my dissertation and completing my final major project on female farmers. The page is incredibly supportive of my work and the women have kindly accepted me into their community. It was through this platform that I got the opportunity to take part in this exhibition and was contacted by one of the members, who is chairman of Herefordshire’s RBST. We discussed the possibilities of displaying my work within the walls of an old barn at Awnells Farm, which had been left lifeless for many years. A wildlife painter had also been contacted and together we were very exciting to envisage our work within this appropriate environment and large, unusual space. We started planning 3 months before opening weekend. I took on the responsibility of sourcing funding and, after many emails and phone calls, was granted £250 from a local Herefordshire fund. To reach a wider audience and aid our chances of being funded, we decided to add an educational aspect. We decided to invite the local primary school to attend, where we discussed farming, animals, art, photography, conservation, wildlife and the farm’s history. The 83 pupils also enjoyed taking part in painting workshops and visiting the farm’s cattle herd. It was a great learning curve for me to talk to young people about my work and inspiration. It was a good way to start the weekend and the funding we obtained paid for all the children’s art materials as well as my photographic prints! I had full control over how I wanted the work displayed, the placement and the edit. I wanted the display to look as industrial as the farm location, as well as the content of the photography. I had seen the work of a photographer who hung prints in an old fishing using bulldog clips. I had a space of 8 meters to hang my work and therefore decided to have 11 large A1 prints displayed using wire and clips. The images were selected from a variety of my photo projects including Female Farmers and Times You Might Get Kicked, which documents a dairy farm. I wanted the overall appearance to demonstrate what sort of photographer I am and most importantly what I love to shoot! When meeting at the farm, I discovered usable equipment that would add to the heritage of our exhibition. For example, I used old fruit crates, hay bales and pallets to stand my photo books on. Taking part in my university degree show, proved a particularly useful experience which helped the success of this exhibition. I applied similar marketing techniques and targeted a lot of advertising on Twitter. I created printed material which was distributed across local areas and was featured in Three Counties Farmer magazine, a free publication sent out to farming communities across Herefordshire, Gloucestershire and Worcestershire. Overall the exhibition was a great opportunity to showcase my work in an extremely appropriate and beautiful location. I met many people from the agricultural community and received industry feedback both in person and via social media afterwards. Because it was part of a larger event, the marketing proved very efficient and had a substantial following. I thoroughly enjoyed the experience and have been asked to hold another exhibition at Awnells Farm as part of Open Farm Sunday next year. Event Report: 'Bloom', Vortigern Gallery, Margate. The Photograd Event Reporter blog series continues with 2016 Photography graduate, Emma Sage. We found her work at Free Range, featured her image and review via our dedicated Spotlight, and she's now part of a collective exhibition based in Margate. This post is written from Emma's perspective so carry on reading to find out more about herself and her exhibition experience. Bloom poster, image from the series Homeland by Scott Thomas. Just a brief bit about me, I’ll keep it short and sweet and get to the interesting part, the photography of course! I’m Emma Sage, a graduate from the BA (hons) Photography course at Middlesex University. My personal practise tends to concern the landscape and environments (check it out here if you like: www.emma-sage.com), but where looking at or researching photography is concerned, I’m not into sticking to one genre! So I’m going to just let you all know about Bloom, an exhibition for recent Middlesex Photography Graduates running at the Vortigern gallery in Margate, it’s a rather sweet little place, pretty close to the sea front, so you can enjoy some great work and then go for a paddle after! 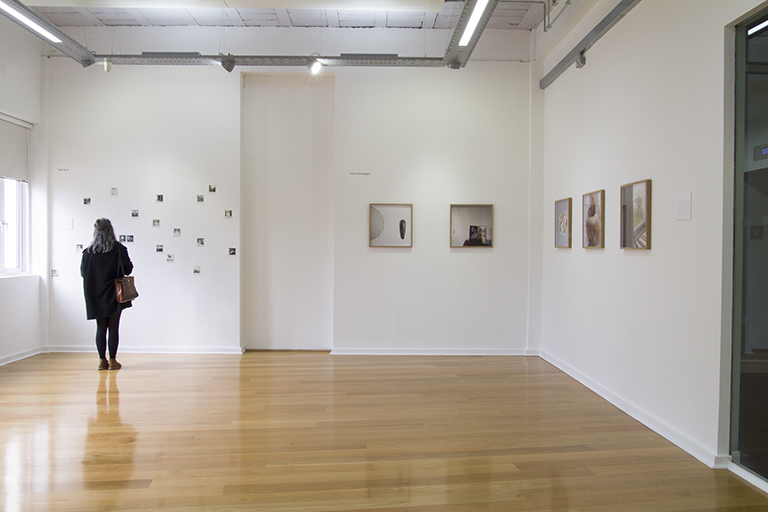 The work rotates each week, our tutor, Mark McEvoy, has been curating the show. There is selected work (i.e. a chosen piece from a students Final Major Project) and one ‘feature’ wall, which includes a larger selection of work from a chosen students series. So there’s a fresh mix of varied work every week, which keeps it exciting! As I have mentioned, the space is fairly small, but there’s also a rather interesting selection of photography books, everything from more local photographers to biggies like Martin Parr and Rinko Kawauchi, so it’s varied and there’s something for everybody. There’s also a collection of postcards, prints and magazines to buy. Below are a few photos to give a better idea of what we’ve been getting up to. ^Left to right: Devon Hampshire, Domante Kantauskaitė, Zowwi Ranford, & Wai Lap Mok. This was week one, a lovely mix of varied work. ^Left to Right: Joe Brayford, Michal Wrona & Marta Liley-Gray. ^My own work from the series Aethon. The feature wall has been pretty varied, Wai Lap Mok kicked things off for week one. We get to do our own thing (within reason). I decided to write on the wall, which was fun! In the upcoming weeks Kaya Murray and Erika Krapavickaitė will have their work on the feature wall so check it out! ^And just in case you need more persuading to come and give Margate and the Vortigern a visit, there’s one of Margate’s famous ‘Turner Skies’! <^ The selection of books and postcards available at the gallery. Find out how to be an Event Reporter for Photograd here.